The earliest generations of fingerprint locks were abysmal. Some could be fooled easily; others were simple to hack. Some even permitted unacceptable rates of false positives. While many of these problems still persist inside of the weaker fingerprint locks on the market, the industry on average has greatly improved over the past few years. Though fingerprint locks are unlikely to replace every locking mechanism you own, there is a reason you see them on smartphone screens, vehicle handles, and even professional terminals. In the right hands, biometric locks have about a dozen significant advantages. To name just one of those advantages, a fingerprint lock means you don’t have to handle keys. If you have three keys, then three people can open a lock. Pretty simple. Now you just have to hope the keys don’t get lost, copied, stolen, handed off to the wrong person, left-at-home, and so on. By contrast, you’ve probably never left the house and forgot your fingers at home. Every lock is made for something different. For some types of locking jobs, simple padlocks are still the way to go. Suppose you’re locking up a maintenance shaft within a caustic environment, like a food processing plant. You’d probably want an anodized aluminum to fight the corrosion. If you’re expecting the lock to endure horrible abuse and mistreatment, a laminated and steel-reinforced lock is probably your best bet. Sometimes you need a corrosion-resistant lock that’s capable of taking constant abuse. But that doesn’t describe what most people need out of a lock, most of the time. The SZHSR Fingerprint Lock is closer to what most people are looking for from a daily use lock. It’s constructed with a fairly durable steel body, intended to resist cutting, smashing, prying, and other attempts at theft. Of course, every lock can be broken. It’s just a matter of how large the tool has to be. The SZHSR Fingerprint Lock will hold up under the smash of a hammer, and it will hold up against some less impressive bolt cutters. 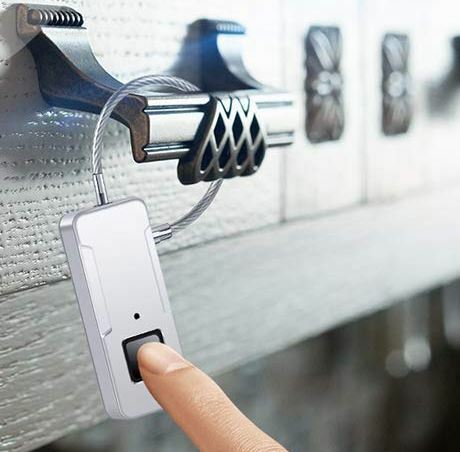 You probably wouldn’t want to stick it on a bank vault, but it’s more than capable of safely securing gym lockers, home cabinets, rental storage units, and so on. 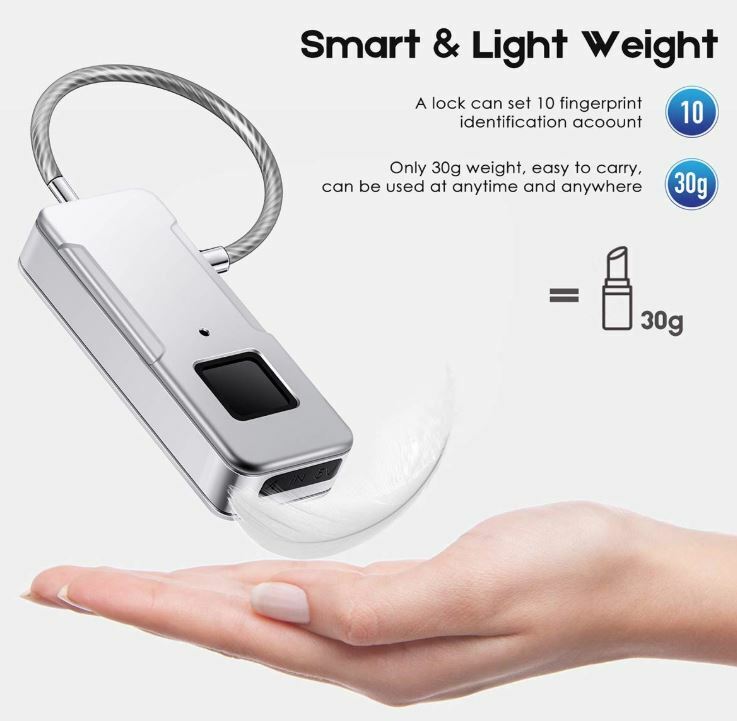 The SZHSR Fingerprint Lock is quite compact, measuring 2.4 x 0.9 x 0.5-inches. Along the topside and right-side of the chassis, you’ll find the entrance and exit points for the included looping steel cable. The external chassis of the locking mechanism is covered with ABS plastic. Plastic on a lock rarely inspires confidence. But the plastic shielding is only present to protect electronic parts against the elements. Because the plastic protection is there, this lock can be used outdoors. 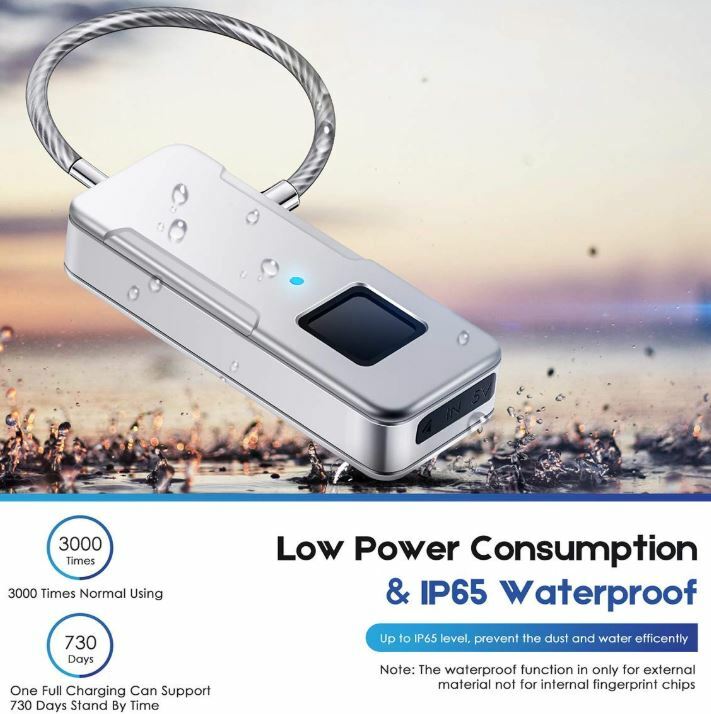 The IP65 waterproof certification will testify as much. That indicates the chassis will protect the lock against dust, sand, dirt, moisture, and so forth. It even offers limited protection against submersion. A smaller padlock tends to weigh about half of a pound. The SZHSR weighs less than an ounce, which is about eight times lighter. That makes this lock grossly more portable than its simpler mechanical counterpart. Along the bottom side of the lock, there’s a 5V USB port which is hidden away behind a protective seal you need to pry off. The included waterproofing protects the outside of the device, not its internal guts. Consequently, this USB seal is necessary to maintain protection from weather. The USB seal does take some effort to remove. But that’s actually a good thing for protection, and only a minor inconvenience because of how infrequently you need to recharge the SZHSR Fingerprint Lock. One of the bigger advantages of biometric locks is that you don’t have to make and distribute keys. 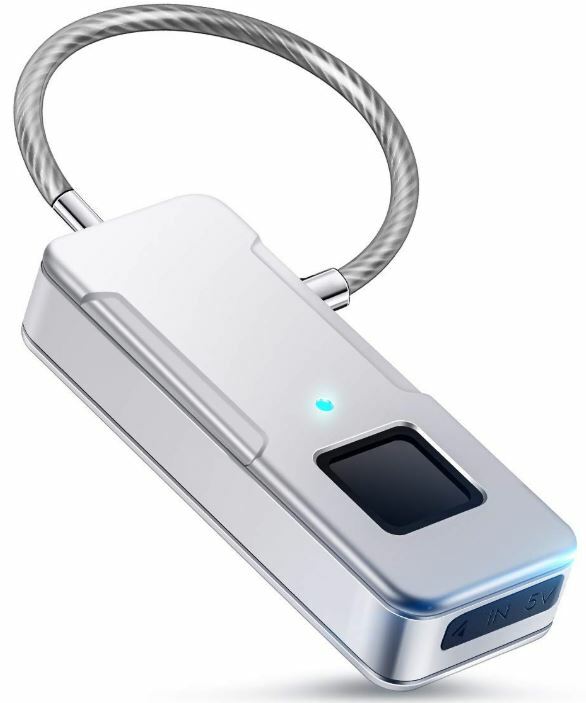 The SZHSR Fingerprint Lock has enough memory to manage ten ID accounts at one time, so ten people can register their prints. And instead of registering ten people, you could register both your index fingers, or both of your thumbs. It’s actually surprisingly simple to pick locks. A decent lock picking set is about $10, and with some practice, just about anyone can get through an ordinary lock. Common locks use pin-tumblers, which are frankly quite vulnerable to being forced open. They can also be filled with gum or similar substances, which can make reentry difficult, or even destroy the lock. You can have a key remade in about two minutes. It’s pretty close to impossible to duplicate a biometric fingerprint. In old spy movies, you’d see people use fingerprints captured on pieces of tape to get past fingerprint readers. Amusingly, with some cheap fingerprint readers, that technique can still work. But these days, any sophisticated reader worth your time will be protected from those kind of relatively simple attacks. 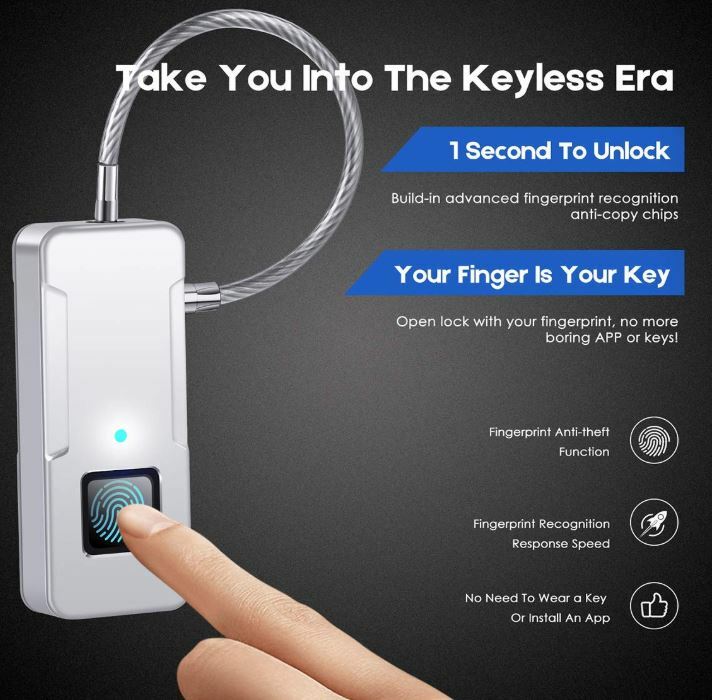 As part of the SZHSR Fingerprint Lock improving over previous generations of similar locks, it includes a fairly powerful recognition chip to help prevent copying. Though cheating the lock in some sophisticated way isn’t totally implausible, doing so would be vastly more difficult than purchasing a $200 pair of bolt cutters, and then using them to destroy any lock in sight. For all their benefits, there are also issues unique to biometric locks like the SZHSR Fingerprint Lock. You can spend all day sticking your mailbox key into your front door. It’s never going to let you inside, not in a million years. But if you put in the right key, and you turn the key correctly, the lock will always open. And with a biometric scanner? False negatives and false positives are both problems, but in different ways. When you put your finger on the lock, you want it to open straightaway. You don’t want to have to repeat the reading process three times. False negatives aren’t of grave concern, but they’re certainly an annoyance. False positives are slightly more serious. If your friend could open your fingerprint lock by accident, you’d rightfully be upset. It’s not terribly difficult to create false positives from unsophisticated biometric readers. Given 5,000 attempts, the wrong fingerprint lock might just fail you. But from a technical perspective, the SZHSR Fingerprint Lock is protected to the point that its battery would give-out long before the lock gave up a false positive. Having to deal with a battery is another one of the downsides of using something like the SZHSR Fingerprint Lock. But fortunately, fingerprint reading isn’t a terribly battery-intensive process. From a single charge, you can get roughly 3,000 reads from the fingerprint lock. Even if you’re locking and unlocking several times a day, every day, you can still expect two or three years of battery life. And suppose you’re not constantly hassling the battery. From a full charge, the SZHSR Fingerprint Lock can support 730-days of standby time. A single year would’ve been impressive enough, but lasting about two years makes the digital component of the lock come with very few comparative disadvantages. The reader itself is modestly sophisticated, making use of a 360° fingerprint recognition sensor. It takes about one second for the sensor to read your fingerprint and respond. It will either immediately pop open the locking mechanism, or completely fail to respond, as though you were touching a dead lock. Because the sensor reads from all angles, you don’t have to angle your finger around the device for your prints to be read correctly. You can basically just touch the pad, wherever it happens to be, and open the lock. These are small differences, but over time, they add up. The SZHSR Fingerprint Lock offers respectable levels of protection. Its steel construction holds up well against lower levels of aggression. It’s quite likely that you could break this lock open with a hammer, and you’re certainly not going to get the lock open by agitating the sensor in the hopes you get lucky. It uses an open-shackle design that’s allows it to easily pass through chain links. But this design actually makes it slightly more vulnerable to attack from bolt cutters. With a good hacksaw or some formidable bolt cutters, the steel cabling would snap. 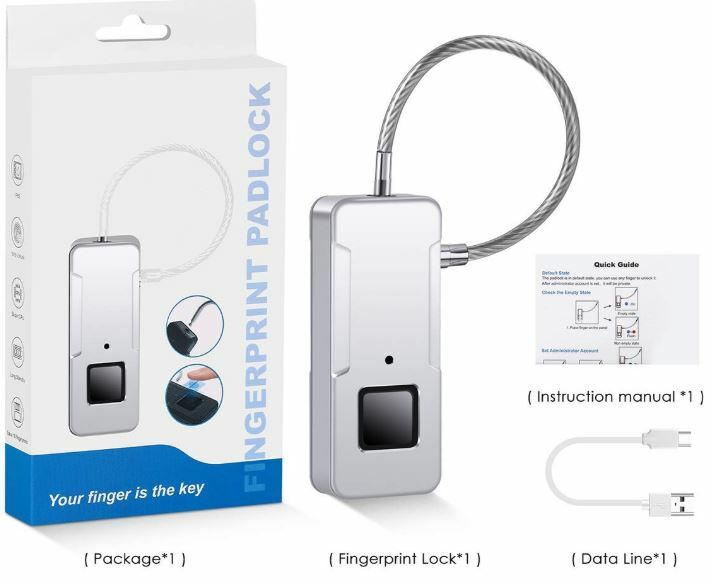 The SZHSR Fingerprint Lock includes its locking mechanism, as well as a short 5-inch steel locking cable. It also includes a USB charging cable, user manual, and a gift box. To its eternal credit, the built-in battery needs little babysitting. Sooner or later, you’re going to have to recharge it. The LED on the front side of the device will do its best to give you plenty of warning. If you fail to recharge the mechanism, you might have a difficult time recharging the lock while it’s in place. Who Should Choose the SZHSR Fingerprint Lock? Forgot to bring your keys? You always carry your finger with you. Want to revoke someone’s access? You don’t have to wait for someone to give you back the key, you can just remove them from the lock. The SZHSR Finger Print Lock may have a battery, but it doesn’t feel like it. Once you’ve got it charged, you probably don’t have to think about charging it again for literally years. The strength of the lock is about as good as any standard padlock. It’s not totally impenetrable, but neither is a good padlock. Provided there isn’t a determined and capable person who’s making it their full-time occupation to bust through your lock, you’ll find it provides sufficient protection. That makes the SZHSR Fingerprint Lock a good choice for using on lockers, protecting your bike, securing electronics, closing cabinets to keep sensitive things from your kids, and for just about any other situation where you might use a padlock. If you’re not expecting your lock to constantly endure the worst possible circumstances, then you’ll find the SZHSR Fingerprint Lock provides more than enough protection in all the ways that matter. And the convenience of being able to open a lock by touching it can hardly be understated.